TDK A73 Wireless Boombox review | What Hi-Fi? The boombox was a staple of the ’80s and ’90s music scene, made iconic by hip-hop artists and John Cusack holding one up outside Ione Skye’s window in Say Anything. It was all about sharing your music with your friends – the ultimate social and portable music device, before the iGeneration came along. Wireless and portable speakers such as the Jawbone Jambox and various iPod speaker docks are essentially the modern day boombox – with the added bonus of streaming music stored on a portable device. Sharing your vast music collection with all your friends has never been easier or more fun. Japanese company TDK has latched on to the idea, with four new wireless systems added to its Life on Record range of speakers. TDK, of course, made its name manufacturing cassette tapes, with its logo displayed for all to see on the digital billboards at Piccadilly Circus in London. 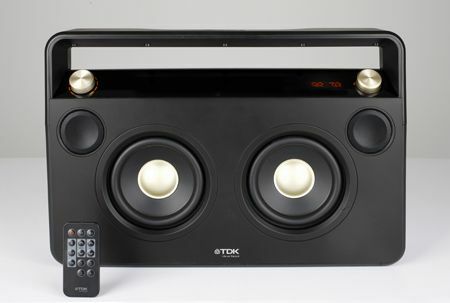 Leading the range is the latest version of the TDK A73 Wireless Boombox, a 2.1 speaker array in a boombox-style package. Twin 13cm passive radiators and 5cm full-range drivers are arranged at the front to emulate the classic boombox look, and there’s a 13cm subwoofer housed at the back. The cabinet itself is styled in a simple black plastic finish. It gives it a modern and streamlined look, with only two rotary controls (one for power and volume; the other for selecting source input) and a sturdy black handle across the top that makes it easy to carry around. While TDK’s Wireless Boombox doesn’t look out of place with the sleek, smart portable devices it will be paired with, there’s a lot left to be desired with the finish of the box. It’s a substantial and weighty product, but the matte black finish with its plastic film covering feels rather cheap and unfinished, and not like a quality piece of hi-fi. When you’re dishing out £300 for a product that’s meant to be moved around and seen by other people, you expect a certain level of design and build quality. In that respect, the Wireless Boombox feels underwhelming – we’d like more care to have been devoted to the finish and quality of the box itself. With wireless streaming, however, things are better. Streaming your music via Bluetooth is easy and painless – just select the Bluetooth option with the rotary control, and you’ll have paired your devices in a matter of seconds. We streamed music from both iTunes and Spotify playlists, and the connection was stable and uninterrupted, with good response time when skipping tracks. There’s also a nice touch of the music fading in and out if you’re muting the song, or if you’re switching between iTunes and Spotify. You can go for the wired option, too, by connecting your smart device or music player from its headphone output to the Boombox’s 3.5mm auxiliary input. It’s a slightly more solid sound compared with the wireless streaming. Along with a headphone out and a built-in FM radio tuner, there’s also a USB port at the back – but this is solely for charging your smart device. The tiny remote control is light and simple with very basic controls, but we found ourselves using it mainly to adjust the volume levels. It’s much more intuitive to change tracks using your smartphone or tablet. We really wish the Boombox had a better finish and feel to it, because it’s instantly listenable once you start to stream music through it. We’d recommend a night’s running it at least to let it settle in, but once it gets going, it’s a very likeable and pleasing sound. The Wireless Boombox isn’t the most open and transparent of speaker systems, and you’ll have to look elsewhere if you’re looking for outright detail definition. But what it does have is plenty of good rhythm and a big dose of fun. Befittingly for a boombox, the sound is quite bass heavy – but not in an unpleasant way. It’s a good strong sound, with not a hint of sharpness to the treble, so it’s easy to listen to for long periods. Admittedly, a stronger treble could give songs a touch more attack and make them sound a bit more exciting, but there’s some scope for adjusting the bass and treble levels via the rotary controls. The Boombox has a broad brush approach to music, so we found it favoured upbeat pop and rock songs rather than classical and vocal-heavy tracks. Birdy’s haunting vocals in Shelter, for example, felt a little unrefined, and the Boombox’s lack of insight meant that nuances of voices never quite surface and the song loses its expressive character. While it has decent timing and good dynamics, it doesn’t quite reach as far into the frequencies at either end as it might. The Boombox feels more at home when just charging along with tracks from the likes of Bon Jovi, Arctic Monkeys and Nirvana, and delivering them with as much enthusiasm as it can muster. It aims for a fun sound rather than taking care to ensure each note is delivered with refinement and detail, and there’s a sense of the sound being smooth and rich rather than precise. The basslines in Sbtrkt’s Wildfire may not have taut and sharply precise edges, but overall it’s a cohesive and smooth arrangement that’s enjoyable to listen to. The Boombox comes to life with more punch and attack when you turn the volume up high, and you’ll find the sharp kick of the treble coming in when you listen to music through the headphone output. Overall it’s got enough detail and good rhythm to make it a pleasant listen. There’s something very likeable about the Wireless Boombox: its fun character and smooth approach means you can quite happily keep your favourite old rock tunes playing for long hours – TDK claims six full hours of portable playback. Its limitations with outright detail mean it can’t quite compete with the very best wireless speakers and docks out there. Despite its not-so-perfect sound, it’s such a nicely entertaining listen that a better finish could have bumped it up to a four-star rating. TDK definitely has to up its game to make its mark in such a competitive market, and even though the Boombox is a likeable product, it’s got a way to go to impress in terms of build and outright sonic performance.